In Rukban camp in Jordan, the UN Refugee Agency (UNHCR) and the United Nations Volunteers (UNV) programme provide medical services to a displaced population of more than 38,000 people. These are seeking asylum in an extremely harsh environment, where most of the basic needs are almost nonexistent. As a qualified medical doctor with rich practical experience in the field, Saima Khan provided essential emergency medical assistance to persons in need of basic assistance. Saima Khan (Pakistan) served as a UN Volunteer Associate Public Health Officer at UNHCR. Here, she is seen at a reproductive health clinic providing services to refugees in Jordan. Saima graduated from Rawalpindi Medical College in Pakistan and obtained her diploma and Master’s degree in Public Health from the London School of Hygiene and Tropical Medicine. After completing her studies, Saima worked as Gender Officer in UNHCR Afghanistan, as well as Medical Officer in University Teaching Hospital in Lusaka, Zambia. Saima joined UNV in Jordan in May 2017 as UN Volunteer Associate Public Health Officer at UNHCR, and recently finished her one-year assignment. 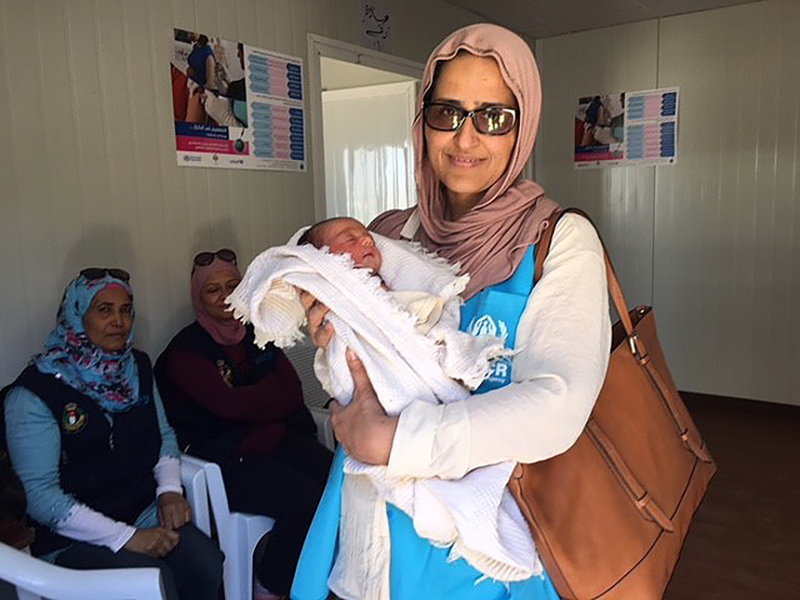 During her assignment, Saima was helping Syrian refugees at the UN-operated medical clinic located in Rukban camp, an arid remote area near the extreme northeast of Jordan, close to the joint borders with Syria and Iraq. Rukban camp has a population of nearly 50000.00 individuals and the UN clinic where Saima served is the only health facility available to provide services for the residents of the camp. "The majority of the displaced population at the camp are women and children, seeking assistance in a place where there is no adequate community health response capacity except for the UN clinic," Saima explaines. "At the UN clinic we provided primary health care for many patients in desperate need for help and I happened to witness many children`s lives being saved. We also helped patients with life threatening ailments to get transferred to hospitals in Jordan for further treatment." Together with UNHCR partners, Saima was involved in program planning, monitoring and evaluation to effectively address public health and health care issues at Rukban clinic. She also ensured that public health services provided at the clinic complied with required national and international standards. Additionally, Saima supported partners in implementation of public health programs and facilitated their access to trainings, with a particular focus on health information and disease surveillance, safe motherhood and integrated management of childhood illnesses.